It’s been many a moon since I was taught Maths in school, I still felt I was suitably prepared to help my Year 3 daughter with her Maths homework, after all I had a good, solid education, a GCSE Maths behind me and could surely help her with the basics? With a completely new strategy for teaching Maths adopted in recent years, it is easy to see why parents are befuddled with the new methods (Number lines, Vertical Methods with no carries, Partitioning, Grid method and Chunking?! ), which make complete sense in their entirety and when explained, focusing the child on WHY and HOW they arrived at the answer rather than just providing the answer. However, taking one look at their latest homework task, I was struggling to know what to suggest – “Explain how you would use 8 + 6 = 14 to calculate 783 + 60. Erm?!? But the question remains, how can I help her? Matr provide one-to-one online Maths tuition to KS2 children, based on the National Curriculum. 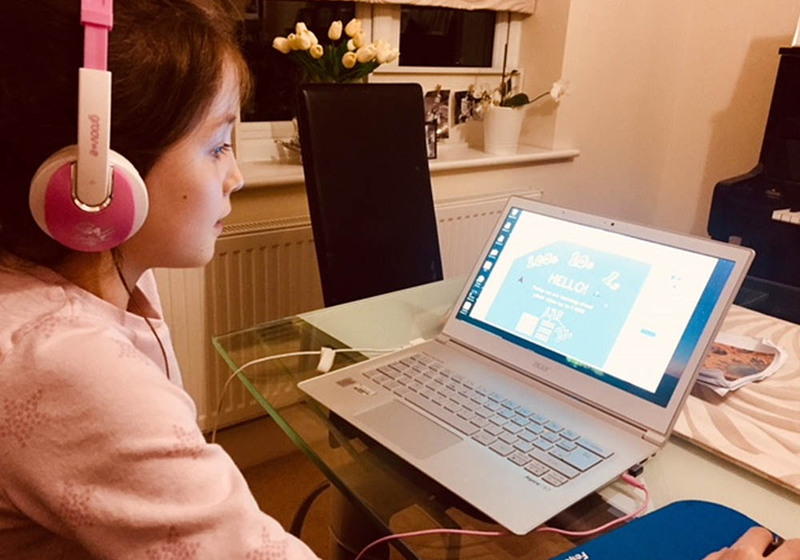 Working with thousands of schools since 2013, they now provide support for families in the form of regular online tuition sessions with a specialist tutor, all in the comfort of your own home. All their tutors are fully qualified and trained in the National Curriculum, in partnership with University College London, background checked and have undertaken safeguarding courses, so any natural parental worries I had on that front were immediately addressed. With the first two lessons offered as a free trial, we signed up and prepared for our first session. Before the first lesson, children can take a Maths test, designed to assess their level and identify any gaps and development opportunities, so the session can be tailored not only in the form of content, but to assign the best personal tutor for your child. Test done, we received confirmation of our lesson slot and armed with headphones and a computer, feeling very grown up, my daughter logged in and she was ready! At 4.50pm on the dot, the tutor came online, introduced himself and the lesson started with an initial orientation of the screen, functions and lesson plan. Children could write on the screen using the mouse (so no need for pen and paper! ), they could scribble on screen to show workings and the tutor could also interact on the screen providing a very effective one-on-one teaching style and session. There were also some fun quizzes to do before and after the session to consolidate any learning. I have to say, the tutor was incredibly patient, super encouraging and explained in a very clear and structured way what to do and how to do it. He allowed enough time for the child to think about their answers and come up with the solutions themselves, offering prompts only when required and to aid learning. The session was really structured, the content was 100% relevant and echoed the teaching style from school. I would absolutely recommend Matr to any parent who is looking for additional support for their child’s Maths learning at home. It is a valuable tool and easy to see why their personalised interactive methodologies have been used in schools so successfully to date. Looking to build your own child’s confidence in Maths? Enjoy a FREE two-week trial to Matr! Pop over to the LittleBird website and check it out here, it’s a brilliant way to get kids back on track!